I’ve noticed something about relationships. Actually, I’ve noticed a lot more things being out of a relationship than I have being in one. The first – and perhaps most key – thing that I have learned in my journey of single life is this: people may not always ask you directly, following a break-up, when you are ready to move on. But they will THINK it. They will subtly hint at it. And then, if all else fails, they will forcefully attempt to get you to “move on” from the ex-boyfriend or girlfriend. People like this are well-meaning. They really and truly are. They care about you and want the best for you. And they believe, in their hearts and souls, that they know how to help you get over your failed relationship. Perhaps they take you out to a bar. Maybe they’ll buy ice cream and watch chick flicks with you in your pajamas. Maybe they’ll write you an encouraging text message or help you work out your feelings at the gym. Or maybe they’ll hit you with their car. Wait… okay, perhaps that last one is just relevant to this week’s New Girl episode titled “Longest Night Ever.” In it, we find a few things uncommon to this sitcom: 1) an episode that features pairings that usually receive less focus (i.e. Schmidt/Jess, Nick/Winston, Coach/Cece), and 2) an episode that strings a singular, important theme throughout all three stories. The focus of “Longest Night Ever” is in regards to moving on. In it, we see Schmidt attempting to move on from his failed relationship with Cece, Nick trying to aid Winston in moving on from his failed relationship with Daisy and channeling his efforts from his cat onto a human woman, and finally we see Coach and Cece both attempting to move on from their failed relationships as well. Each person who is attempting to move on clings to something different in the episode and each learns a truth about themselves and their relationships. Schmidt learns, at the end of the episode, that he isn’t fine. He spends the entire night attempting to convince himself that he is, but learns that being truthful to himself is one of the first and most integral steps in the healing process. Coach learns to regain confidence in who he is as a person. His identity had been tied into his ex-girlfriend for so long that he forgot how to be himself without being an “us.” And Winston? Well, Winston learns the values of trusting in himself, rather than his security blanket (Ferguson). Both he and Coach have been hurt in their previous relationships, so this episode heavily focused on both characters regaining their confidence and learning to “put themselves out there” again, as it were. But “Longest Night Ever” wasn’t just an important episode in developing characters with failed relationships – it was an episode that also highlighted the importance of Jess and Nick’s presence in the lives of these wacky roommates. It also, interestingly enough, provided a (whether intentional or not) great contrast between the failed relationships of these friends and roommates and the successful and solid relationship between Nick and Jess. The two weren’t heavily featured as a couple throughout the episode (there were some cute moments in the beginning), but I quite enjoyed that. Their presence as individual characters is so important to New Girl and I know that Liz never wants to sacrifice their individuality for the sake of their romance. Jess and Nick play important roles in their friends’ lives and this episode exemplified the lengths to which they are willing to go in order to see their friends happy, successful, and growing as adults. Moving onto the plot of the episode, Nick and Jess are planning a date night in (watching Homeland and having dinner) until Winston asks if Nick can cat-sit Ferguson. While Jess doesn’t want to cancel their plans, Nick is insistent: it’s the first time that Winston has shown interest in going out and meeting women. So he’ll watch the cat. Schmidt then bursts through the front door with his own piece of earth-shattering news: Coach is asking Cece out on a date. Max Greenfield is immensely talented and fantastic and nuanced and utterly sells Schmidt as this crazy, egotistical, often smarmy guy who still has a good heart. But my issue is that I still don’t think Schmidt has admitted to himself or to anyone else that what he did was WRONG. It still seems as if a part of his character is justifying this – he’s treating his break-up with Cece like a normal break-up, instead of one that was induced because of his selfishness. There IS a redeeming moment at the end of the episode with Jess, but even then, Schmidt does not APOLOGIZE to Jess for his behavior. He simply acknowledges that she has every right to be furious with him (and hit him with his car). And so, if I could give any critical note to the writers and producers this season, that would be it: does Schmidt really believe that what he did was wrong? And if he doesn’t believe that, how can we – as the audience – forgive him for such horrendous behavior, no matter how many “good” things he does? But I digress: Schmidt explains to Nick and Jess that Coach asked permission to pursue Cece. And while Jess is excited that Cece is potentially going on a date with someone so attractive, she quickly warns Schmidt that he NEEDS to be okay with this. Bitterness still edged in her voice, she explains that he blew it with Cece and now must face the consequences of that decision. When Schmidt insists that he’s fine, Nick and Jess are doubtful, the former with good reason. He was, after all, Schmidt’s roommate in college and knows that when the man professes to be fine, he’s usually not. Cece accepts the date and Coach actually (in a moment that is completely selfless) ensures that Schmidt is okay with the date before proceeding. Coach tells Schmidt that all he has to do is “say the word” and if it makes him uncomfortable, he’ll call the date off. Schmidt, remember, is driven by his pride and ego and will not admit to being weak. He can’t bring himself to confess that he’s uncomfortable with the date. And as we have learned in episodes past with these characters, pride is a vice that when left unchecked can (and does) do serious damage to relationships and characters. Nevertheless, Schmidt refuses to discuss his issues with the impending date and then Coach – surprisingly – admits to his OWN misgivings. He’s nervous, he explains, because of his failed relationship. He knows that Cece is amazing and is afraid of allowing those insecurities to have free reign. But what’s really interesting is this: Schmidt actually gives Coach a pep talk. First and foremost, Coach and Schmidt are friends. And whether he momentarily forgets who they’re discussing or knows and focuses on Coach’s needs instead, Schmidt actually helps his friend by encouraging him. “You’re the prize,” he says. I believe this is a legitimate selfless moment for Schmidt. He has everything to gain by attempting to get inside of Coach’s head – by psyching him out or telling him that Cece truly IS out of his league. But instead, Schmidt tells Coach that HE is awesome and this… well, it unintentionally backfires on Schmidt momentarily. Now full of confidence (and cockiness), Coach recognizes that he is awesome and intends on taking it full-speed ahead with Cece. Elsewhere that evening, Coach shows up at Cece’s for their date and begins to act so awkwardly that it rivals pilot episode Jess. While his awkwardness is weirding Cece out, Coach’s next behavior – and the one that he adopts of a self-centered, cocky player – is even more of a turn-off for the young woman. And see, this type of persona is easy for Coach to adopt not because he is a bad person or a jerk but because it’s what he associates with confidence. He believes that if he comes across as disinterested and schmoozy, Cece will be more attracted to him but he’ll also be more attractive to HIMSELF. Coach doesn’t like where his last relationship landed him: emotional, insecure, and vulnerable. So he attempts to metaphorically dress up in this new, “confident” persona in order to help him look better to himself and others. Back at the loft, Schmidt is getting antsy and trying to leave, and Winston returns home. When the trio is confused by his presence, Winston explains that his night didn’t go very well. He’s afraid that it’s been so long since he’s been around people and women in particular that he doesn’t know how to talk to them anymore. And then, Winston accepts his loneliness, so long as he has the presence of his cat, Ferguson. Winston in this episode represents that specific group of individuals who have suffered from heartbreak and are not quite ready to move on (they tell themselves). Oh sure, these individuals go out, but their hearts are not in dating. They are social to appease people in their lives, but have yet to move past the obstacles that are truly preventing them from moving forward in relationships. Winston, as I said earlier, has a security blanket in Ferguson – he doesn’t really try with the women at the bar because he doesn’t care enough to. He doesn’t see any issue with dating because in his mind, he’s not really alone. He has a pet. But when Nick leaves the window open and Ferguson escapes, Winston’s entire world is shattered. He now has nothing to fall back on. He is now ENTIRELY alone. And that terrifies him. So he demands that Nick help him look for the cat, and Nick obliges (begrudgingly, because it means leaving Schmidt in the care of Jess). Schmidt freaks out at the prospect of being alone with Jess and Jess does similarly. I really do think this scene is telling (and reminiscent of “First Date”) because everyone turns to NICK for help. He’s the one they need to stay, to aid them. Jess does her best to try to entertain Schmidt in the loft, but all of her antics are coming up short. Finally, the exasperated roommate decides to take Schmidt out to the bar because he’s driving her crazy. I love that when Schmidt objects to leaving the apartment, Jess tells him that Nick doesn’t know everything. It’s a nice reminder that even though Jess is typically referred to as the more emotionally mature one of the loft group, she also messes up and makes mistakes. Her first and biggest mistake in the episode is, of course, letting Schmidt out of the apartment. She wants to believe that she knows what is best for him but the truth is that NICK is the one who does, not her. Out on the lean, mean city streets, Winston and Nick are driving around in an attempt to locate Ferguson, but their search turns up empty and Winston is growing slowly and slowly more distraught and frustrated. When he pulls over, the man insists that he shouldn’t have gone out that night and he wouldn’t have lost Ferguson. But Nick has a different view: Winston should go out to MORE parties, not less. The man then admits to the party being a bad idea because he was shot down by multiple women. Winston’s confidence – which, prior to entering the party was virtually non-existent – took a huge hit when he was rejected by those women. It took a lot for him to even muster up the energy to “put himself out there,” and he regrets it because of the response he received. But what Winston doesn’t recognize (and what Nick and the audience DOES) is that Winston will never learn to have confidence unless he continues to try and put himself into situations that grow that confidence. He cannot continue to fall back on Ferguson for support when he really needs to have human interactions. At the basketball game, Coach is continuing his charade of suave d-bag and Cece is finding it less and less appealing as the night wears on (especially when she says she’s not hungry and he buys seven pretzels in spite of her protesting). Back at the bar, meanwhile, Schmidt is not thrilled about being coerced into mingling with women, but Jess insists that this will aid him in getting over his break-up. For all of her issues with Schmidt (they should be and are numerous considering the fact that he cheated on her best friend), Jess is oddly supportive of Schmidt throughout the episode. It is, of course, because she DOES care about him and want the best for him. But Schmidt has other plans when he sits down at a table across from a beautiful woman: he tells her about his woes, about Cece being his soulmate and out on a date with another man, and then instructs the blonde to allow him to sneak away when Jess isn’t looking so he can go after Cece. The blonde does as she’s instructed and Jess notices, fleeing the bar after Schmidt. Meanwhile, Winston gets a phone call alerting him that someone found Ferguson. He and Nick venture to a female bus driver named Bertie who is… well, she’s odd. But she has a weird connection with Winston that Nick begins to notice. (His uncomfortable faces throughout the entire flirtatious exchange are hilarious.) And though the entire flirtation is befuddling Nick, he’s still supportive of Winston because it actually looks like he is making an effort to seek human companionship rather than feline. Schmidt is running down the streets, yelling at his phone in order to find the Staples Center (to no avail, might I add). 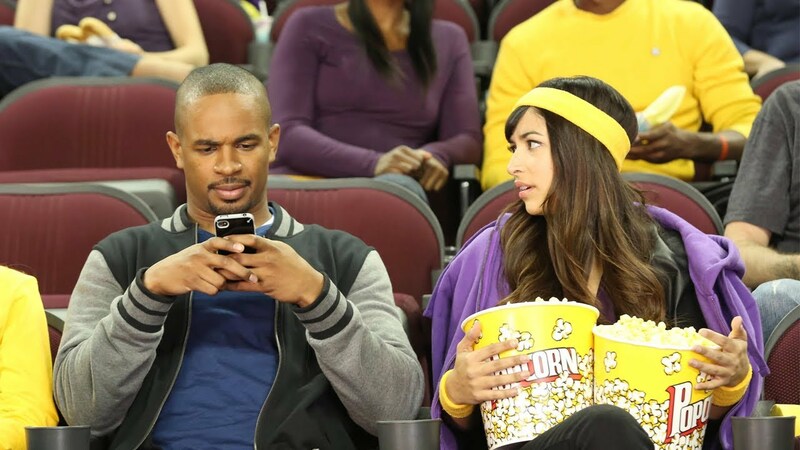 At the game, Cece has become so fed up with Coach’s rude and dismissive behavior that she walks out on the date entirely. It’s only then that Coach recognizes that his adoptive persona is more harmful than helpful and he chases her down. At Bertie’s house, things are progressively getting weirder and more intense (and more awkward) in the flirtation department for Winston and Bertie, making Nick feel a growing sense of discomfort. But the truth is that Winston actually feels a connection with Bertie because she’s raw and honest and real, even in her quirks. That’s something that Winston lacked in his relationship with Daisy (who, let’s remember, lied and cheated on him). In fact, Winston feels such a connection with Bertie that he instructs Nick to leave and take Ferguson home too. This is a huge step for the man: he’s actually voluntarily separating himself from his security blanket. Though it’s played comedically, this is a moment of character growth for Winston and – even in Nick’s uncertainty regarding Bertie’s odd behavior and habits – represents the “moving forward” moment that Nick wanted Winston to so desperately have. I absolutely loved this Nick/Winston story (it’s been a while since we’ve had a fantastic plot with just these two characters, though “Eggs” is still my favorite to date) because it demonstrates the lengths Nick is willing to go to in order to help his friend. Like “Eggs” was about Winston helping Nick, “Longest Night Ever” is about Nick supporting Winston even when his behavior is seemingly odd. Because that’s just what friends do. With the Nick/Winston story winding down, the Coach/Cece one begins to as well. (I really loved the pacing of this episode because everything fell very naturally.) Coach chases Cece down and admits that the person he has been texting the entire night was his mom. He confesses that he was nervous and Cece is skeptical (remember that she, too, just emerged from a relationship in which she was lied to), but upon seeing the actual message from Coach’s mom, begins to soften. I wasn’t sure about the idea of a Coach/Cece romance, to be quite honest, until I saw this episode. After viewing, I found myself actually drawn toward these two individuals. They’re kindred spirits, really – they’re both attractive and sometimes proud and sometimes awkward but also full of heart and compassion. They’ve both been hurt and are trying to heal but don’t know quite how to do that. They’re rebuilding themselves because everything they once knew fell apart with those old relationships. And I think that this is WHY they work well. The playing field is leveled and they’re actually able to understand one another. You know, I’ll be okay if they want to pursue this relationship or at least just explore these two characters interacting more together. I really will. As the other two stories wind down, so does the Jess/Schmidt plot. Jess, now in her car, is chasing Schmidt down the street in order to coerce him back to the loft. But as she does so, Schmidt tells Jess that he loves Cece and needs to tell her. Instead of encouraging the man to pursue Cece again and confess his feelings, Jess tells Schmidt that he NEEDS to let Cece move on. He needs to let go of her. And I think that this is the best advice Jess could give. I know that she is biased in regards to the Schmidt/Cece relationship because she is Jess’ best friend, but the teacher is right – it’s not fair to Cece and it’s not fair to Schmidt to continue to reopen wounds. That’s not how someone moves on. And they don’t move on by sitting and doing nothing, either. They move on – as Jess explains – by taking life one crazy, long night at a time and by acknowledging their need to move forward. Perhaps Schmidt assumes Jess won’t actually follow through with her anger and bitterness, but she DOES. And she hits Schmidt (lightly) with her car, inciting utter disbelief in the man. And then, just as Schmidt is ranting about how out of control Jess is, a police car flashes its lights and… Jess accidentally hits the gas pedal, REALLY hitting Schmidt with her car. The pair explains the situation to the paramedics and cops to the best of their ability and it’s going about as well as one might presume it would. Schmidt defends Jess, explaining that she hit him because she’s a good friend and he is in a vulnerable, weird place. The pair returns to the loft and Jess cuts the engine outside, and she and Schmidt begin to argue until the man pauses, mid-sentence, and sees Coach and Cece kissing in the distance. Jess softly explains to Schmidt that it’s okay to not be okay and he doesn’t have to lie to her or to himself anymore. Finally – after spending the entire episode denying it – Schmidt admits that he isn’t fine. It’s the first truly honest moment that the man has had the entire night and I’m quite glad it was with Jess. Schmidt and Jess have never seen eye-to-eye, and they’ve been at odds, understandably, since the whole debacle with Cece and Elizabeth occurred. But I loved this episode and that Jess was the one to be there for Schmidt during his low point because there’s something that strengthens your friendship with someone when you go through those rough times with them. And though Schmidt isn’t entirely fixed, though Coach isn’t completely free of insecurities, and though Winston is probably still afraid of getting hurt or lied to, the point of “Longest Night Ever” is that you can begin to move forward, no matter where you’re coming from. The key is to do it one step at a time and with a friend beside you, ready to catch you if necessary. Jess’ slip-up of: “When we’re married” was the BEST EVER.